With the Germany vs. France EURO 2016 semi-finals match just around the corner, national hype around football has reached an all-time high, kicking off a major innovation spike in the German food and drink industry. From patriotic designs to football-focused language and packaging, the tournament launch pad is driving an appetite for food and drink innovation and limited edition products. And it seems that it’s just not on the football pitch that the country is on a winning streak. According to Mintel research, Germany is the most active country when it comes to event merchandise claims on food and drink products in Europe. Here, Julia Buech, Food & Drink analyst at Mintel, looks at how retailers and brands are looking to capitalize on the hype surrounding the championship and which new product ideas provide a marketing ground for food and drink in Germany. 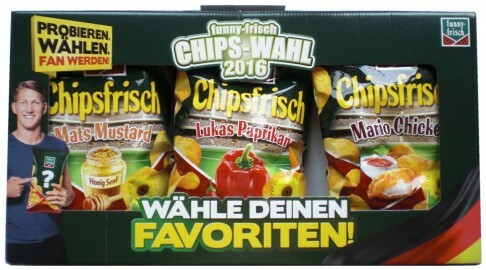 Ahead of EURO 2016, the funny-frisch crisps brand let consumers vote for their favourite summer limited edition offering, incorporating the teams more popular players. “Mario Chicken”, “Lukas Paprikano” and “Mats Mustard” varieties fought it out for the title, and “Lukas Paprikano” was voted the winner. 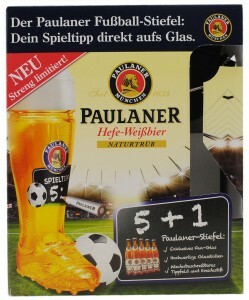 Beer and football prove once again to be a classic combination, with Paulaner Beer introducing an exclusive boot-shaped fan glass with a betting game plan and a crayon. 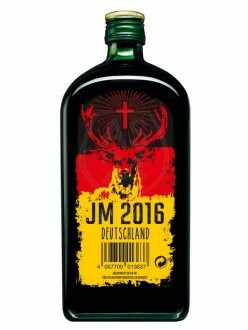 We see other alcoholic brands also getting creative, with Jägermeister launching a JM 2016 Deutschland limited football edition bottle. 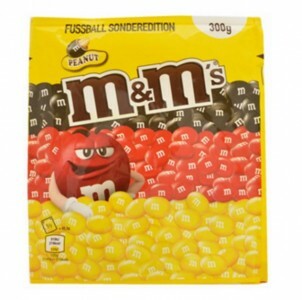 Being a major promoter of the event, Mars introduced its M&M's Peanuts in limited edition packaging for the European Football Championship 2016. 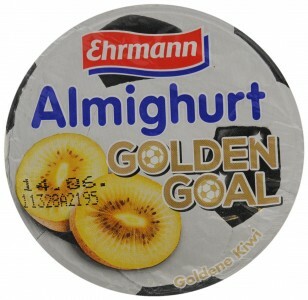 German dairy brands are also infected with the football fever, with Almighurt predicting a golden goal on the packaging of its new Kiwi-flavoured yoghurt. 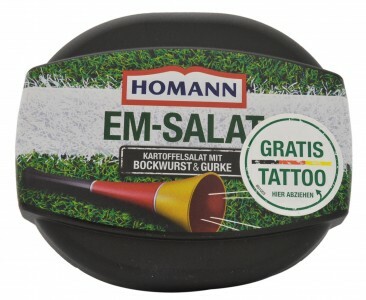 Homann “EM-Salad” Potato Salad with Smoked Sausage and Gherkins is available in a fan design edition featuring the German football team and a consumer competition. 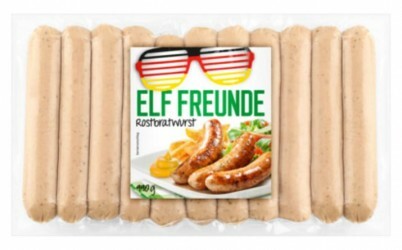 For many Germans, watching the game and a barbecue with friends goes hand in hand -- an occasion that Penny’s “Elf Freunde” (Eleven Friends) sausages are targeting. 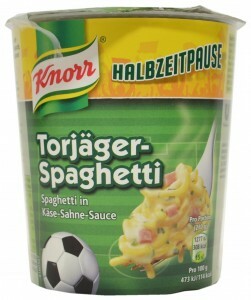 Knorr provides the “half-time” snack solution for famished football fans with their “Torjägerspaghetti in Käse-Sahne-Sauce” (Scorer Spaghetti in Cheese-Cream Sauce). 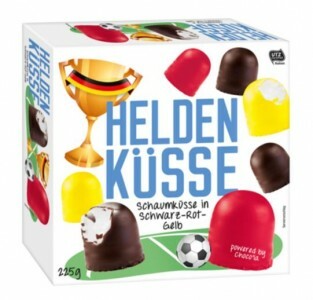 Meanwhile, Penny launched its football party range, including a marshmallow products dubbed “Heldenküsse” (Hero Kisses) in the colours of the national flag. And, finally, we see that the football craze extends to non-food sectors such as personal care, with brands like Rossmann’s Perlodent launching a football toothpaste with a black, red and golden colour mix.